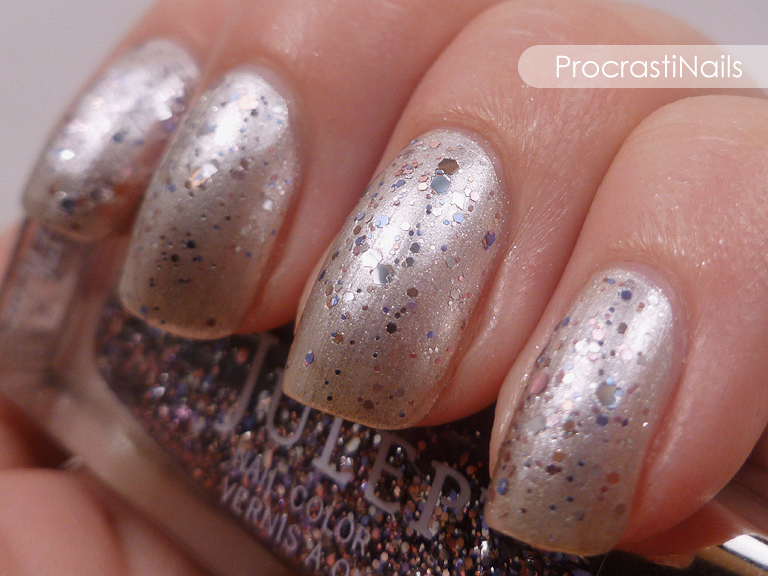 You guys, I think these are my favourite Julep polishes to date. 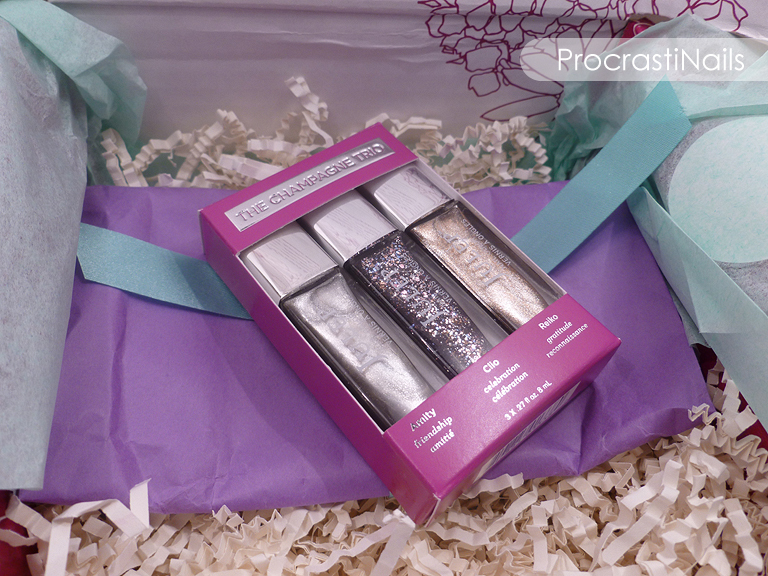 This is The Champagne Trio, which was one of the possible add-on's available with this month's Julep boxes. I have a post with my base box colours coming in the next few days, but I just had to swatch and post these as soon as I could so I could share how much I love them. Ahhh! This "one-time, exclusive" collection of polishes was put out to celebrate Julep's 2nd anniversary. They said that they chose the names they did to "share our joy at having reached this milestone, our appreciation for everyone who helped us get here, and the connection we feel with our Mavens." The names of the polish are Amity (friendship) which is a soft metallic silver, Clio (celebration) which is a mult-colour glitter topcoat, and Reiko (gratitude) which is a rose gold foil. 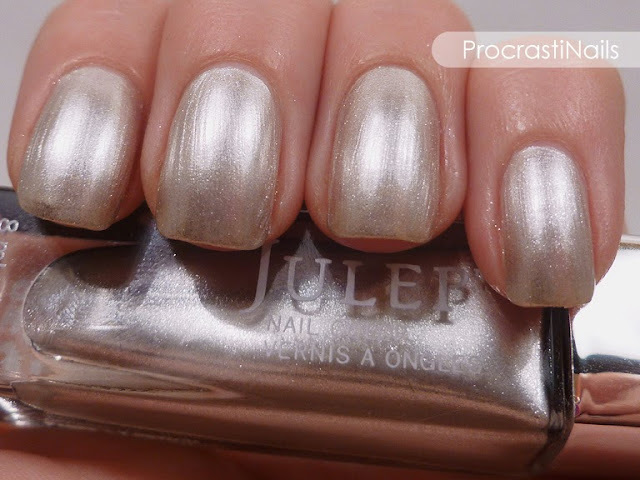 Julep Amity is described as a "white gold metallic" and it has a nice metallic pearl finish. There's some silver microglitter in it that adds that extra bit of sparkle. 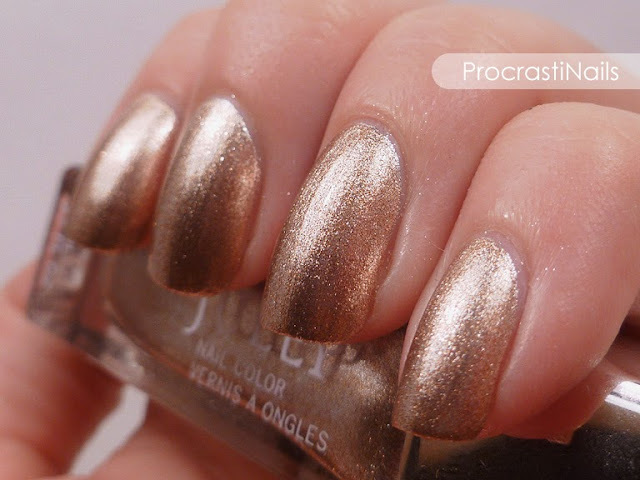 When I first started applying this colour I was worried it was going to be sheer like a lot of Julep's light polishes. I was pleasantly surprised! This is three coats of Amity without topcoat, and you can't even make out any of my nail underneath. Perfect! 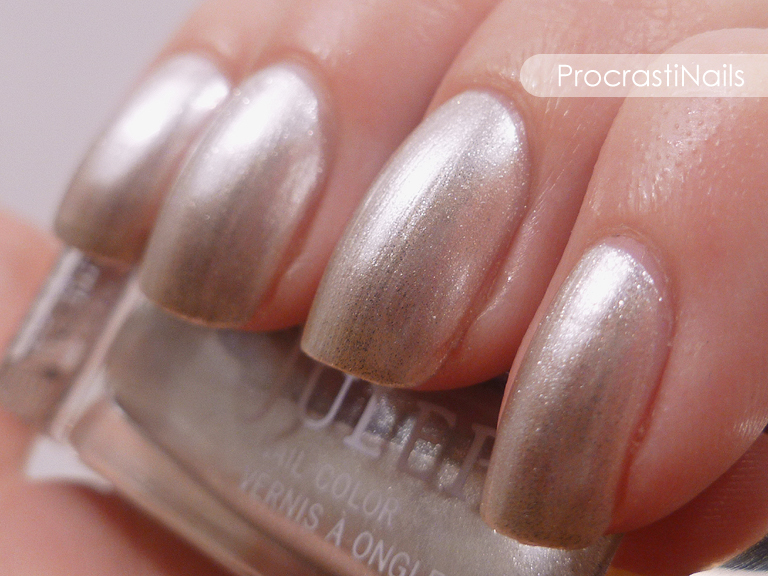 You can see a bit of the brush strokes, but that's standard for a metallic polish. 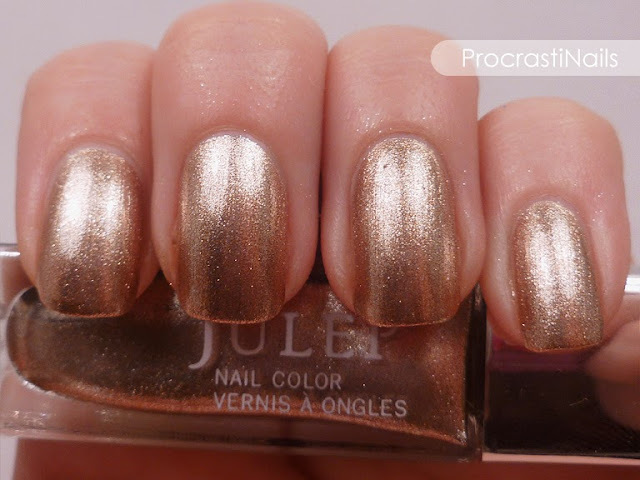 Julep Reiko is described as a "rose gold metallic" and it was the colour that first drew me to this set. I don't own anything like it! It's a lovely foil polish that goes fully opaque with two coats (which is how many coats are pictured here, with no topcoat). I don't have much else to say except that I love this colour! Love love love! In real life it's the barest hint more pink than it looks pictured here. 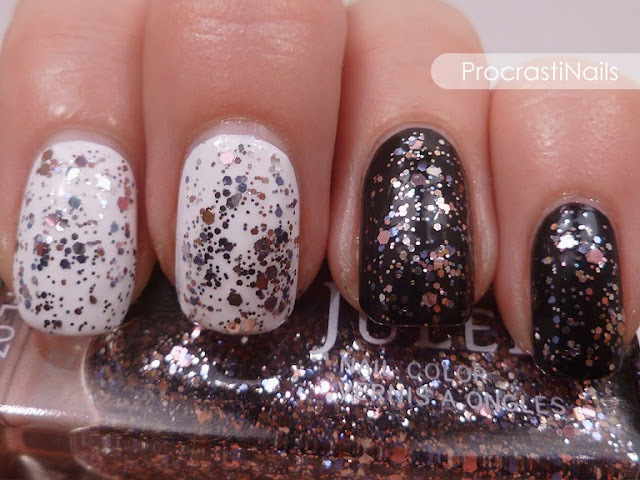 Julep Clio is described as a "silver, pink and lavender multi-dimensional glitter," though the lavender looks more blue in certain light. 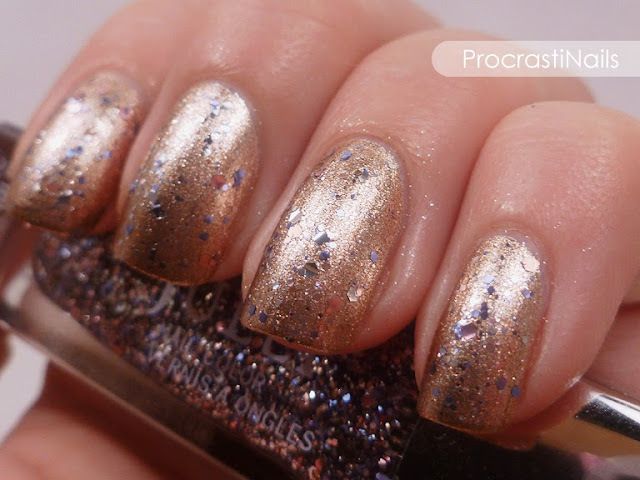 Either way this is a gorgeous glitter topcoat. The hex glitter are three different sizes and you get a lot of polish on the brush when you pull it out. The swatching on top of Amity and Reiko had some of the glitter wiped off of the brush first, but the swatches below (with it on top of Sinful Colors Black on Black and Sally Hansen Xtreme Wear in White On) were done with a full brush of glitter. You can see the difference. If you were committed to it I bet this glitter would be almost full-coverage after three coats. This combo feels like a real celebration to me! \o/ The purple really pops off of this base. 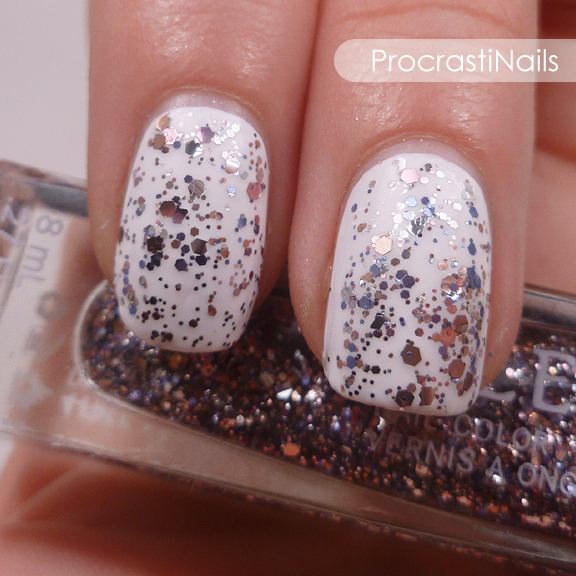 I swatched Clio over black and white polish for this post as well, because I know when I'm looking for new glitter to buy I like to see what it looks like with those bases first. 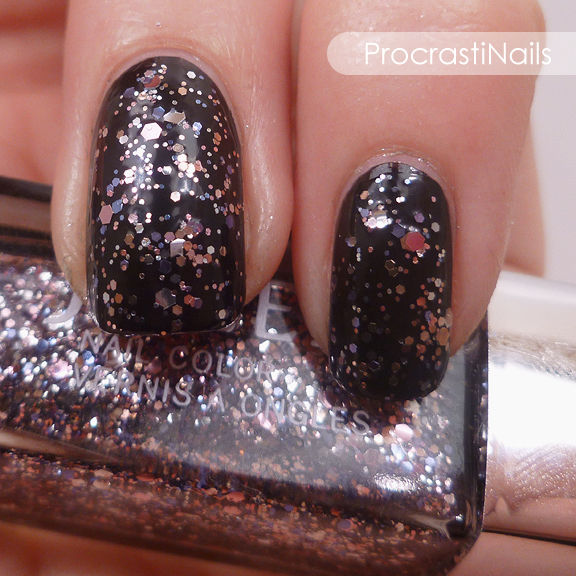 Clio here is layered over SC Black on Black and I think it's my favourite combination so far with this glitter. The colours just pop so well off of the black, and you can really see every piece of glitter. So what's your favourite Clio combo? Is there a different shade you'd like to see it swatched on top of, outside of the ones I've shown here? Let me know! All nail art represented here and elsewhere on my site (unless indicated) is my intellectual property and Copyright © ProcrastiNails 2013. Please do not re-host elsewhere without asking. Wow, I love these polishes! What a great set! They're all gorgeous colors and I LOVE how Clio looks on top of Amity!